Cumberland Kayak provides everything you need to paddle the beautiful Cumberland River. Caves, tributaries, and historical sites dot the landscape, and with some luck you'll see blue herons, turtles, beaver, fish, and purple martins. 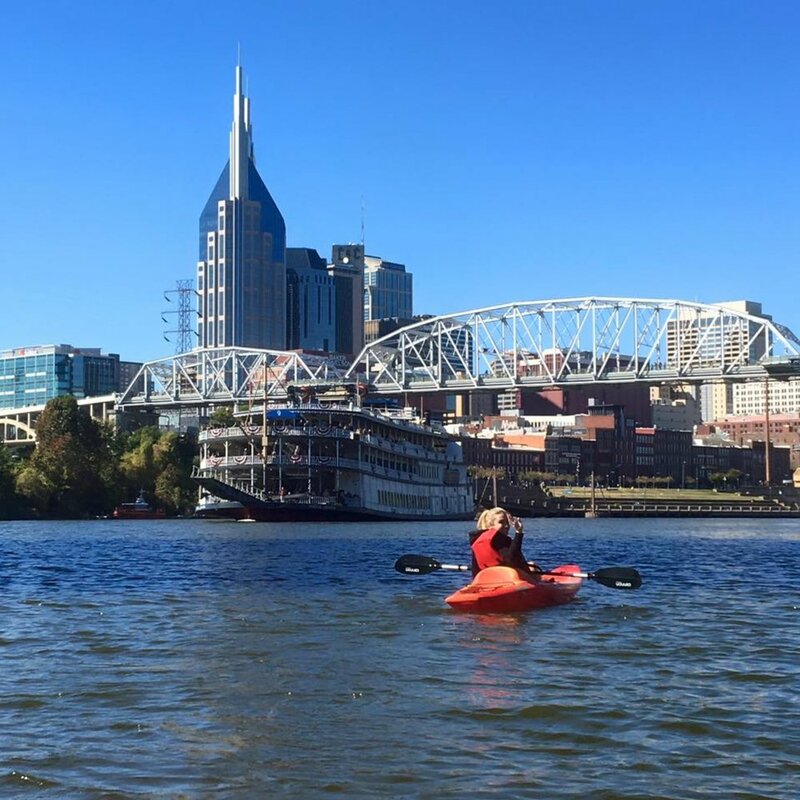 Kayakers that choose one of our Skyline Paddles will end their journey under Nashville's iconic skyline, a great place for stunning photographs. Book your trip today! All prices are per person. Tandem kayaks can only be booked in multiples of 2. Large group outings and corporate events are welcome. Special scheduling may be possible. Please call 615-800-7321 or email booking@cumberlandkayakadventure.com with any questions. Our 2019 river cleanup dates with Cumberland River Compact and Turnip Green Creative Reuse will be announced soon! Our 2nd Annual Golden Pheasant triathlon with Walk Bike Nashville will be back in September, 2019! Our 5th annual Halloween Paddle with Nashville Paddle Co. will be in October 2019. More details soon! Description: Our most popular route! Float along Shelby Park as you journey to downtown Cumberland Park on this self-guided urban paddle. Several bridges, as well as blue herons, turtles, and kingfishers, highlight the route, and an unhindered view of the Nashville skyline marks the finish line. Transportation: Shuttle upstream to the put in, float back to Shelby Park. Description: Explore rock bluffs, Mill Creek, and Demonbreun’s Cave along a 5 mile stretch of the Cumberland. This self-guided nature paddle is outside of the city center, and you’re sure to spot various wildlife from purple martins to turtles to blue herons. Description: Combine the Shelby Park Nature Paddle with the Skyline Paddle and experience the best of both worlds! Guide yourself along 8 miles of the Cumberland with sights ranging from creeks to caves and bridges to bluffs. Wrap-up under Nashville’s iconic skyline and easy access to downtown. Description: Put in at the Percy Priest dam for a leisurely, scenic paddle along the Stones River. You'll pass under bridges and travel alongside the Stones River greenway. This is a great paddle for spotting turtles and blue herons! Note: The flow of the Stones River is impacted by the dam at Percy Priest lake. Trip times can vary. Want extra time to kayak downtown? Transportation: Meet at Cumberland Park, shuttle to Shelby Park, kayak at your leisure and end back at Cumberland Park. Description: Book two back-to-back Skyline Paddles and use the extra time to kayak upstream from Shelby Park or spend more time downtown! NOTE: PLEASE REMIND STAFF THAT YOU ARE KAYAKING FOR THE EQUIVALENT OF TWO TRIPS! We’ll be announcing our 2019 river cleanup dates with Cumberland River Compact and Turnip Green Creative Reuse soon! Our 2nd Annual Golden Pheasant Triathlon with Walk Bike Nashville will be in September, 2019! More details soon! Sunscreen, hat, sunglasses, water bottle, ziplock bag for phone and other items, shoes and clothes that can get wet. A phone is also nice for pictures, and can be helpful if your arrival is much earlier than expected. Cumberland Kayak is not responsible for lost or damaged phones. Where is Cumberland Kayak located? Cumberland Kayak is a mobile business. Our shuttle usually picks you up at Cumberland Park (2 Victory Avenue), near the Bridge Building and Titans stadium. However, during certain events (Titans games, city festivals, etc.) all trips meet at the Shelby Park boat ramp. We will notify you and post on Facebook if we are using an alternate pickup location. Both Cumberland Park and Shelby Park (alternate site during events) have parking lots available for park visitors. Parking for Cumberland Park, however, can be limited during events. Our meeting locations are next to greenways and B-cycle (bike rental) stations, so biking and walking are also great options. Is the van shuttle before or after we kayak? Can I meet you at Shelby? We shuttle whenever possible on the front end of your trip because it's more customer friendly. This way, you can depart at your leisure when you finish kayaking--no waiting around while we load boats, or for other kayakers that haven't finished yet. Meeting us at Shelby Park is possible with advance notice, but we usually can't offer you the van shuttle back after your paddle. Will Cumberland Kayak shuttle my personal kayak? Unfortunately, we do not have space on our trailers to shuttle other kayaks. What is the weight capacity of a kayak? Our fleet is comprised of Jackson Kayak Rivieras (single kayaks) and Riviera-Ts (two person tandem kayaks). These are great, stable sit-on-top kayaks made just up the road in Sparta, TN. This is a rain or shine activity. If Cumberland Kayak suspends activity due to severe weather (lightning, thunderstorms, etc. ), you will have the opportunity to reschedule, but we do not offer refunds if you decide to cancel due to weather. For additional information, see our Booking Policy. I'd like to rent a kayak for another river/lake. Do you rent kayaks for the day/weekend? No, we just rent kayaks for our routes. Can I make a large group or corporate booking? Large group outings and corporate events are welcome. Special scheduling may be possible (weekdays more likely). Please call 615-800-7321 or email booking@cumberlandkayakadventure.com to inquire. All children and teenagers under 18 must have a completed Parental Consent Form and be accompanied on the water by an adult. Anyone 13 and over can paddle their own boat at the discretion of the parent, while all under 13 are required to share a tandem boat with an adult. Children under 10 should have previous paddling experience and be with a parent or guardian. Each adult can be responsible for up to 4 children. If someone under 18 will be kayaking without their parent/guardian, our Parental Consent Form must be filled out in advance. Every person must wear a life jacket at all times while on the water. No exceptions. The consumption of alcoholic beverages is prohibited while on the water. Intoxicated individuals will not be allowed to kayak. Small dogs with kayak experience are allowed on trips as long as they are wearing a life jacket. Note: space in the van shuttle is not guaranteed or always possible for dogs. Providing your own ride/shuttle is recommended. This is a rain or shine activity. If Cumberland Kayak suspends activity due to severe weather (lightening, thunderstorms, etc. ), you will have the opportunity to reschedule. We do not offer refunds if you decide to cancel due to rain or other reasons. However, if notified via email at least 48 hours in advance, we are happy to reschedule your float (current year and season only) when possible at no charge. If there is availability, you are welcome to rent a kayak without a reservation. However, online bookings are highly encouraged, as we cannot 100% guarantee a spot over the phone without payment. If the departure time is imminent, please call ahead (615-800-7321) to confirm availability and notify us of your party. Note: Cumberland Kayak reserves the right to cancel a scheduled paddle if no one has booked in advance. We regularly host river cleanups with local non-profit, Cumberland River Compact. We encourage our staff and customers (if they are inclined) to pick up river trash when possible, and are happy to provide a river cleanup bag if requested! Our river cleanups are announced on Facebook and at the bottom of our routes/booking/2% for a Better World pages! Cumberland Kayak is committed to environmental sustainability. As part of our 2% for a Better World program, we donate 2% of all sales to non-profits that are making a difference in our community. Each month, 1% of all sales goes to our non-profit partners for river cleanups, Cumberland River Compact and Turnip Green Creative Reuse. Fundraiser paddles for additional nonprofits will be announced below. Come kayak for a cause and make the world a better place! 1% of Sales, All of 2019. Three million people and thousands of species depend on clean and abundant water from the Cumberland River. The Cumberland River Compact's efforts in education, restoration, and outreach all contribute to keeping our water healthy. They work on root problems of water pollution and give people the tools to be smart, impactful stewards of their watershed. Turnip Green Creative Reuse diverts materials from the landfill (200+ tons and counting) and reroutes them to students, teachers, and creatives in underfunded communities. Their mission of fostering creativity and sustainability through reuse is executed through a second hand art supply retail space, arts education outreach, 2 reuse galleries, and a studio space that is open to the community. Because this innovative nonprofit is growing so quickly, proceeds will support Turnip Green's new building campaign! TennGreen protects Tennessee’s most valuable natural treasures. Their works has conserved incredible places like Cummins Falls, Devilstep Hollow, Grassy Cove, and Virgin Falls. Founded in 1999, the Harpeth Conservancy mission is to restore and protect clean water and healthy ecosystems for rivers in Tennessee by employing scientific expertise and collaborative relationships to develop, promote and support broad community stewardship and action. Pet Community Center provides low-cost, high-quality care so that pets can stay happy, healthy, and in a home with the people who love them. Their goal is to reach a 90% live release rate at the Metro Nashville animal shelter, meaning that 90% of animals leave the shelter alive through adoption, return to owner, or transfer. We're now hiring for the 2019 season! If you're interested in working with us this summer, please email info@cumberlandkayakadventure.com with your experience (outdoor work, customer service, driving/backing up a trailer), availability, resume, and why you're interested in working on the river. Thanks! !